Have you been looking into the benefits of natural pet supplements and questioning if it makes sense for your pet? Just like human supplements, there is no shortage of options available to pets. It can be rather overwhelming if you aren’t sure of what each one is intended for. So, is it worth the investment? Here we’ll take a look at the top benefits of giving supplements to your pet. First things first, while many of the pet supplements on the market are perfectly safe and can offer great benefits for your animal, some can cause harm if not used properly. For example, giving your animal too much of something, such as calcium, can cause more harm than good. Did you know that if you feed your dog too much calcium they can actually end up with skeletal problems? Another example of too much of a good thing is too much vitamin D. In dogs, this can lead to a loss of appetite and even muscle atrophy. What this means is that when in doubt it’s always best to ask your vet if the supplement is safe to give. The vet can also give you information on the proper dosage for your animal. Another tip is not to look at natural supplements as a way to meet your dog or cat’s health and nutritional requirements. A healthy balanced diet should always be a priority. Supplements should be used to fill gaps or help with specific issues. If you don’t think their current food is fulfilling all their dietary requirements, it’s time to find something new. In general, there are some typical issues and ailments where pet supplements can prove to be very beneficial. In particular, they can help with inflammation, pain, and digestive problems. Other issues they can be beneficial for include immune system deficiencies, skeletal issues, joint pain and inflammation, hair loss, mouth and gum disease, and arthritis. As far as what kinds of supplements are best to take, it’s based on the animal’s health issues. What About Making Homemade Dog Food? Today, pet owners seem to be focusing much more on the health and nutrition needs of their animal. It’s not unusual to find owners making their own food. This also allows them the opportunity to add various supplements to ensure all the needs are met. A simple Internet search will provide pet owners with all kinds of ideas and recipes for home-made food, and then it’s up to you to decide what additional vitamins you want to add. Thanks to the vast amount of supplements available to pets today, it likely won’t be long until we see health food stores popping up specifically for animal needs. As far as the most common supplements go, there are a few that you’ll come across time and time again. These tend to be very helpful and versatile, in that most pets can benefit from them at some point in their life. Chondroitin: Typically, you will find chondroitin mixed with glucosamine rather than on its own. Both animals and people can benefit from these supplements as they work to decrease the pain and inflammation associated with osteoarthritis. Osteoarthritis is very common in animals as they age. Multivitamins: The idea is that pets get all the vitamins they need from their food, but sometimes that isn’t the case. A high quality organic multivitamin can do an excellent job of filling in those gaps. Before giving your pet a multivitamin, be sure to take a look at what their food offers so you can then figure out what is missing, or where it may be falling short. Fish Oil: If your animal suffers from arthritis or skin allergies, then fish oil can prove to be incredibly beneficial. 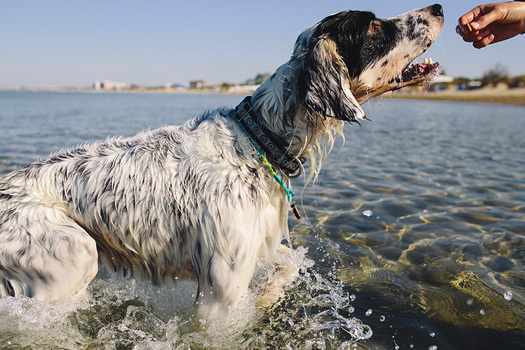 Recent studies have shown that for dogs who are on steroid medications to treat allergies, using fish oil can actually help to decrease the dosage required. Because the use of steroids over a long period of time can cause issues, finding a safer, more healthy solution is ideal. Digestive Enzymes: If your pet seems to be having issues digesting their food, then digestive enzymes can certainly aid in the process. These are meant to help your animal’s digestive system so they can more efficiently break down their food. Digestive upset can be painful for your pet and even turn them off eating. Glucosamine: Just like with chondroitin, glucosamine is being used to help reduce inflammation and pain that is affecting your pet’s mobility. Glucosamine works by rebuilding the animal’s damaged cartilage. This means it can actually slow down the progress of arthritis. Obviously, this becomes more important as they age. Just be sure to check with your vet about the proper dosage information so you can achieve the maximum benefits. Probiotics: Probiotics aren’t just important for people, they are also important for animals. They are the friendly bacteria found in the gastrointestinal system and play a very important role in digesting food. They also help to build up your animal’s immune system and help them fight off pathogens. If your pet is suffering from diarrhea and upset stomach, they may be lacking in probiotics. It’s best to make an appointment with your vet to rule out any illnesses before putting them on probiotics. They come in chew, capsule, and powder form and sometimes are found in dog food. There are so many different aliments and issues that vitamins and supplements can help with, and in many cases, it makes complete sense to give them to your pet. However, it’s wise to keep in mind that too much can lead to problems. Also, it’s just as important to use the right type of supplement to address their particular issues. Excellent tips! The most I can get out of my Vet is “if the diet is healthy they don’t need supplements”. I don’t believe that. If any pet has any condition it can probably be helped by natural supplements! I’m kind of addicted to pet supplements because I’m always so worried about them and I have show dogs. My faves are multivitamins, fish oil, spirulina, your clay and a vegetable powder for humans. They’re fed homemae food & treats with some canned Halo so I have something to mix the supplements into. No kibble. My cats are adopted so I like to think their diet kind of makes up for their rough start in life when they wer starving. Thank you so much for this informative article. I have been making my own dog food for about a year now, and it seems I have included all the necessary supplements. Thanks also for recommending that people speak to their vet. After the first 3 months on homemade food, I requested my vet do a metabolic panel lab test. My dog is better than ever, and her vet is impressed! Nice Article, I like these common pet supplements. I think in beginning we always prefer to make the homemade food for our dogs because its healthy as compared to other dog food products. After that we can use these pet supplements. Thanks again for this informative content.